The main question I've been asked when I've told people I'm getting golf tuition at Pro Shot Golf Club in Stacey Bushes is "how far can you hit it?". We hadn't really done anything with drivers up to this point, but today Nick let me loose on the virtu al driving range. First, we started with my swing control and refining what I was already doing. 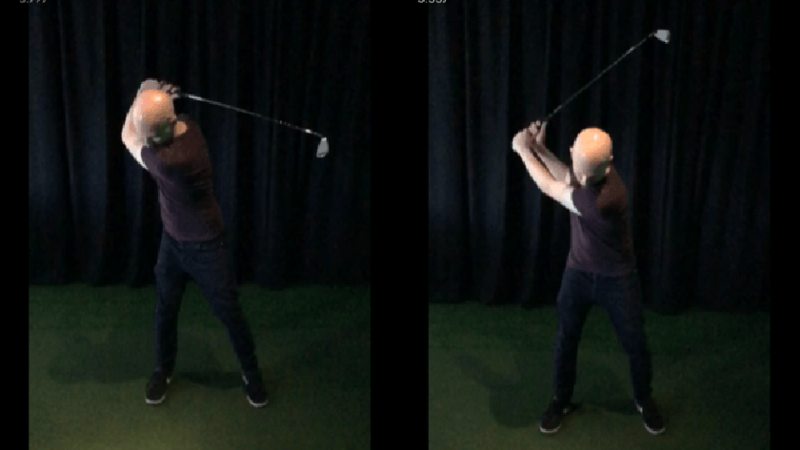 You can see in this before picture (left), that at the end of my swing, I was losing my grip on the club; the club is almost touching my back. Then, with Nick Moncur's instructions, the after picture (right) looks much better. My wrists and grip is firm and the club is remaining at right angles to my arms. The difference in what you do after hitting the ball has a remarkable affect on the flight of the ball. Similarly, with the beginning of my swing, I was getting sloppy with the straightness of my arm. Your left arm should be straight when you swing back and your wrists locked at a right angle. Although not perfect in this picture, this adjustment makes a big difference to the result. 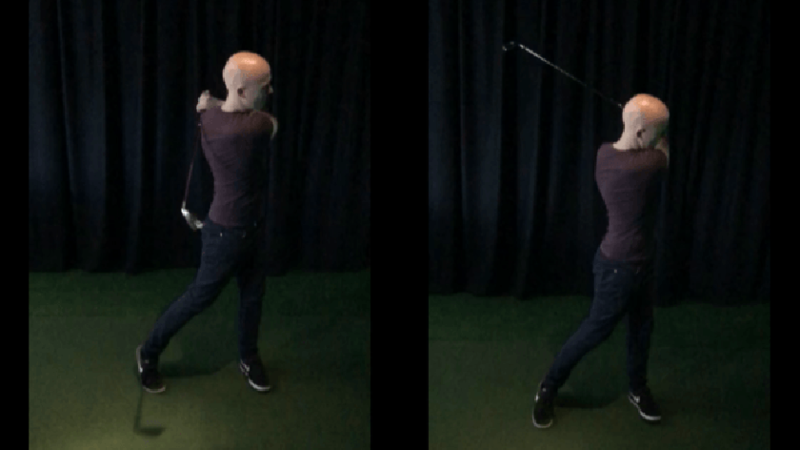 Getting these areas of the swing correct minimises the chances of anything in the middle going wrong, so we concentrated on controlling these areas of my swing. Then we moved on to a driver. I hadn't actually ever used a driver before so it was an exciting experience. Nick taught me the slightly different posture compared to using an iron and, after I got used to it, we worked on the distance of the drive. Somehow, we managed to capture my furthest drive on camera! Below is the evidence that I can actually hit a ball 166.3 yards. There's plenty to remember and practice but the great thing about Pro Shot Golf Club is that you can physically see how the changes you make to your technique are affecting the shot with all the stats available.